Many noble people have made insightful comments based on their wisdom and firsthand experience over the last 2,000 years concerning the things of God. There is a fresh or classic quote for every morning and each evening. There is a wide range of subjects and information present in a variety of formats (information, opinion, historical occurence, discovery) that could cause you to think, challenge your life or confirm your faith. Read the timeless wisdom twice a day (one morning, one evening) from the Bible's book of wisdom that includes both common sense and spiritual insight. 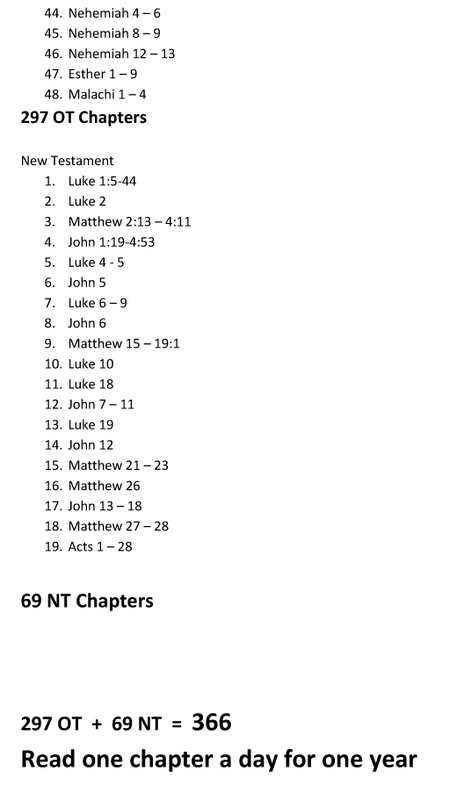 NARRATIVE - Read one chapter a day (mornings only) to read chronologically through the entire narrative or storyline of the Bible. The program follows chronological order through Genesis, Exodus, etc., Joshua, Judges, Samuel, Kings, etc., Gospels and Acts. 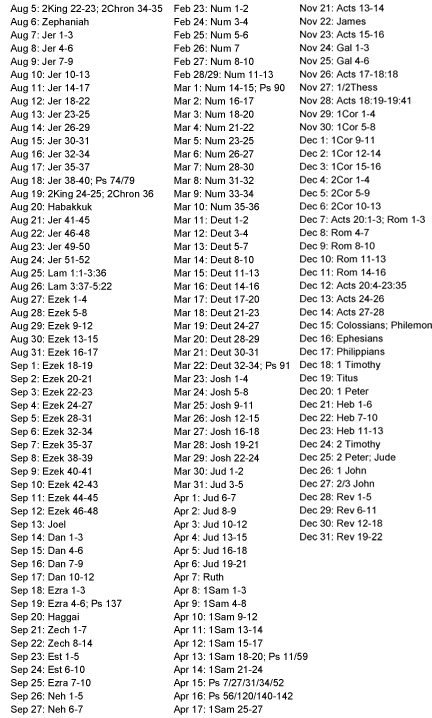 A link to a .pdf with all the scripture references is here. GENERAL TEXT - Read two chapters a day (one morning, one evening) to read chronologically through the entire narrative of the Bible but also include important and insightful chapters from Leviticus, Psalms, Isaiah, Jeremiah, etc. 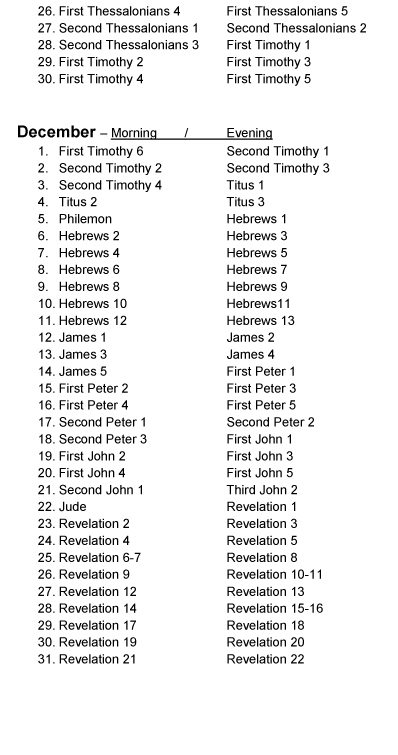 (other prophets), and every chapter of the New Testament epistles. 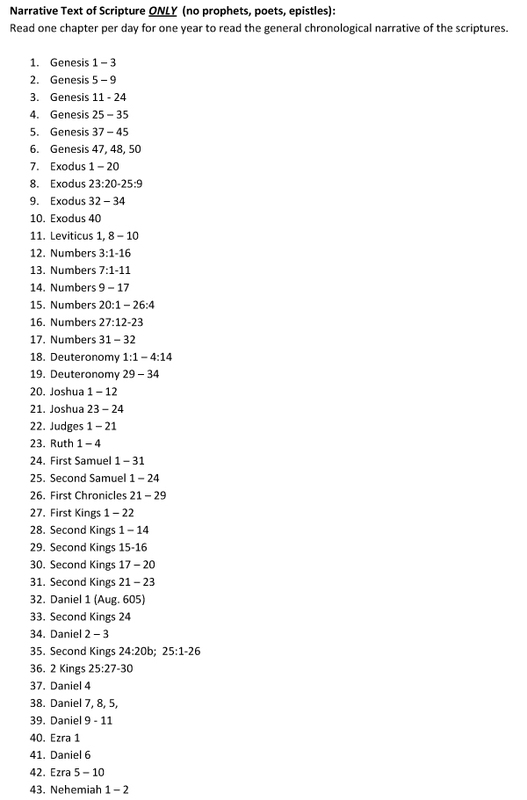 A link to a .pdf with all the scripture references is here. COMPLETE TEXT - Read 3-4 chapters a day (1-2 morning, 2 evening) to read through the entire text of Scripture in Chronological order. 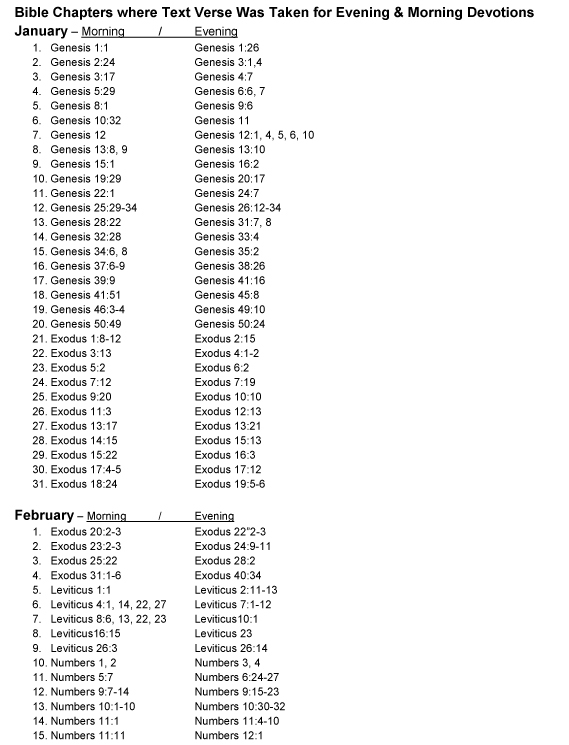 A link to a .pdf with all the scripture references is here. Each morning a Hebrew word found in the Old Testament is defined and examined to enhance our insight. In the evening devotion a Greek word from the Greek New Testament is the focus of a similar study to strengthen our understanding. PERSONAL - A topic from a wide, random list is present for you to mention in prayer concerning your own life. CHURCH - A subject to consider praying that involves the local church is made available for your prayer consideration. NATION - A need or area of concern for your nation is listed to seek God's intervention and direction. Ideas and insight for this portion often come from a website called "Presidential Prayer Team". (You can join the "The Presidential Prayer Team 'Prayer Wall' " HERE.) Get fresh, daily updates for constant national prayer subjects HERE or by clicking on the "daily updates" link beside each day's prayer suggestion. WORLD - From 'the definitive prayer guide to every nation' called "Operation World" there is a country and one of their primary needs is presented for prayer. These subjects are taken from a book of needs collected by the "boots-on-the-ground" in these countries and made available for us to join in intercession. See the website here. (The book is here.) Also, get fresh, daily updates for the country featured for that day by clicking HERE or by clicking on the "daily updates" link beside each day's prayer suggestion. One of thousands of photos of Israel and Jerusalem taken by Galyn Wiemers is presented with a brief description. Clicking on the image will open a large photo for online viewing. These photos can be downloaded and used as needed. A map of a biblical event, a location in the Bible or a diagram presenting insight into events, locations, theology or study is presented at the end of each devotion. Clicking on the image will open a larger image for online viewing. These maps and diagrams can be downloaded for personal or ministry use.